Great discussion about Podcamp Ohio tonight. Thanks to Angelo for giving us the latest information and thanks to Daniel for calling in to talk about the three sessions that he will be presenting. I feel like such the slacker because I backed out on doing a session - oh well. You can listen to the show on the player above or download the show by clicking this link. Also, thanks to Kat for calling in at the end of the show to talk about show 100. Plus, my thanks to those who were able to check out the post show over on my ustream.tv link. I'm on call this weekend, so there will be no Saturday show. But, next Thursday, I will be at a conference in Hilton Head and hopefully I'll be able to broadcast Show 101 from there. Have a great weekend everybody! Dr. A Show 100 Tonight! Can you believe that I have been doing 100 of these shows now? Thanks to BlogTalkRadio for not canceling me - I really appreciate it! What better way to commemorate the occasion of the 100th BTR podcast - with a visit from our friends at Podcamp Ohio. Angelo from Podcamp Ohio 2 will be joining us to update us on the event. Following Angelo, who knows what else we'll talk about? *If you are new to the show, I encourage you to catch us live. There is a great chat room that also goes on. You can even see my shining face on the webcam. In addition, you can call into the show to say hello. Can't catch us live? That's ok. You can listen anytime after the show as it is saved as a podcast so you can listen later. I've been a bad show host in that I have forgotten to put up the links for the two previous shows. As you remember, on Show 98, we talked about the huge medblogger meetup which will be taking place before BlogWorld and New Media Expo this fall. The Medblogger meet up will be Thursday, October 15th, 2009 in Las Vegas. 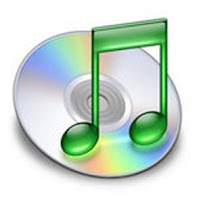 You can listen to show 98 on the player below or download here. 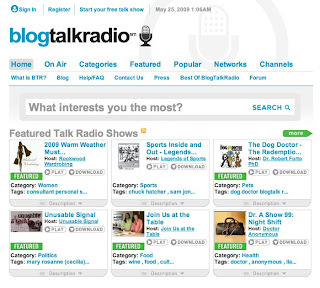 For Show 99, I want to thank BlogTalkRadio for featuring the show at near the top of the page (see graphic above). I was very pleasantly surprised with this. As you know, Show 99 was "The Night Shift with Dr. A and Kat." At the beginning of the show, we talked about how I saw a movie and went to a winery before the show - that's what made the show so entertaining. You can listen to Show 99 above in the player or download the show here. The 2nd part of the Show 99, we talked about some news stories including the kid and mom who were on the run from court ordered chemotherapy. In advance of the long memorial day weekend, I did want to wish everybody a great weekend and hope you have a great time in whatever you're doing because it is the unofficial start of summer - YAY! However, just don't forget the reason for the holiday. Thanks to all those who are serving or who have served in the armed forces. My freedom is because of you, and I will never forget that. 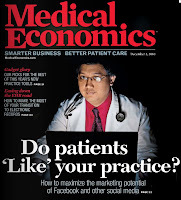 The main topic this week will be the HUGE Medblogger Meetup which will be taking place on October 15, 2009 in Las Vegas right before Blog World and New Media Expo. There is a specific programming track for medbloggers and you may have seen the list of the panels on Dr. Rob's blog (BTW, today is Dr. Rob's Three year blogging anniversary - Congrats Dr. Rob!). There's also great information over on Emergiblog about this meeting. I'll also be talking about my recent appearance on local TV news talking about asthma. I'll take you behind the scenes of what I was thinking before, during, and after the segment. I also received some interesting feedback that night and the following day - so you can't miss that discussion. Update (4:30pmET): I have another evening meeting this week (yeesh), and I think that I won't be home until a little later than I thought. So, I'm going to push the time of the show back an hour to 10pm Eastern Time. I remember when I first started this show, my first prime time slot was 10pm - Ah, memories. Anyway, just wanted to give everybody a heads-up. Plus, with my lack of energy level tonight, I'm only aiming at a 30 minute show tonight. Hope to see you later! I don't know why I haven't been writing a lot over the past few months. Sure my work, and over all life, schedule has been crazy, but everyone who blogs - pretty much has a busy schedule. I do admit that in addition to not writing a lot, I haven't been reading a lot of blogs either. I know that reading other people's blogs would motivate me to write - at least sometimes. Thanks to Kat for being my co-host on tonight's show. She updated us on what's going on in her life. Kat always shares the best stories! We then went into the news including Pfizer giving free drugs to those who lost their jobs, how to choose the right meat, and a Cincinnati area BBQ place having a mannequin with little clothes on (really). Also thanks to Ben for calling in tonight to share a little bit about his adventures with skype. Kimmie also called into the last part of the show. Kimmie said that there is a waiting list for getting the bacon vodka (really). Finally, I asked Ben to talk about his recent experience with doctors in the care of his daughter during her hospitalization. I actually extended out the show to two hours tonight, because our buddy Burl was feeling under the weather and had to cancel his show tonight. You can listen to my show on the player above, or download the show here. Don't forget to check out the video post above. Hope you're having a great weekend! No, Show 96 is not actually the season finale. It's just that, at least in the eastern and central time zones, the season finale for some of your favorite TV shows will be going on at the same time of this live show. But, my show will go on -mainly because I don't watch too much TV anymore and probably because I cannot help but like hearing myself talk - hehe. I will be covering some news stories this week including all this talk about US Health Care reform by the White House and Congress this week. (I guess with the Swine Flu story fading out in the press, this was a good time to talk about health care reform again lol) You'll see a video above that was released by the Associated Press early this week. In the social media world this week, the most popular story has to do with Twitter (imagine that). There was a decision made this week about Twitter users not seeing certain comments made about them and possibly to them. This caused a huge twitter user tantrum. And as Facebook before them, the company responded by somewhat reversing their decision. We'll discuss further on the show. What other stories am I following, check out my delicious bookmarks to see what else I might talk about on the show. The news stories I covered this week include Busts 4 Justice, Michael Phelps getting back into the pool, Swine/H1N1 story being overblown, Boston Trolley Crash, and Lady Liberty's Crown open to the public again. I also talked about by my time in Chicago with our pals Annie & Burl and Kimmie. Sorry that Kat wasn't able to join the show. Not only did I forget to tell her about the show, Kat was feeling a little bit under the weather. (Get well soon Kat) Hope you're having a great weekend everybody. Don't forget Mother's Day on Sunday! We had a great time on this week's show talking about various news topics like face transplant, hand transplant, medical iPhone applications, and more. I also shared a little about my week and about my recent trip to Chicago. You can listen to the show in the player above or download the show here. I also invite you to The Night Shift with Dr. A tonight, Saturday, May 9th, 2009 at 9pm Eastern Time on BlogTalkRadio. Join me and co-host Kat from the BTR show "Llanview Lowdown" to discuss a variety of topics including current events, health, medicine, entertainment, and whatever else comes up. We're talking medicine & health news stories on this week's Doctor Anonymous Show. Probably the most interesting medical news story this week has to do with Connie Culp who revealed herself during a press conference that she was the recipient of the first face transplant in the US which occurred almost 6 months ago. Our good friend Ramona also wrote a post about this event this week. 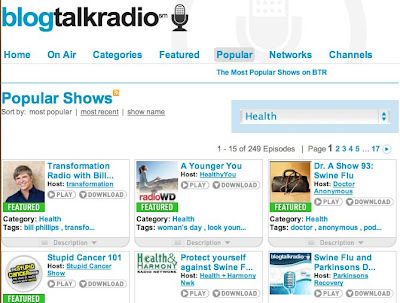 Thanks to all of you who checked out last week's show talking about the swine flu. As you can see from the graphic below, the show was the third most popular show in the health category last week - Thanks to all of you! I really appreciate it. So, I'm finally piecing together some of the video that was recorded during my recent trip to Chicago. The video above is the first installment. This is day one and the first segment of this video is the beginning of my day as I go to the hospital even before I officially get on the road for my journey. This video ends with some thoughts as I get to my first destination. More to come. Enjoy! For the bulk of the rest of the show, I thought it would be interesting to talk about what's going on with the swine flu. Apparently, we can't call it that anymore in favor of the en vogue term "H1N1 virus." Oh well. I gave just a little bit of clinical information. And, then there was a call from California - a health professional on the ground there. He shared his theory (which I agree with) as far as why the media is making a bigger story of this than it really should. Then, I got two prank callers in a row. Want to see how I dealt with them? Well, you'll just have to listen to the show in the player above or download the show here and listen whenever you like. I also played you tube clips from a swine flu vaccine (from 30 years ago), from an amusing public service announcement "song," and finally a clip of what the vice president said today about traveling. Sunny also called in to share some thoughts about this situation. Sunny was trained as a nurse and lives in Texas. Finally to close the show, I shared a little bit about my experience in Chicago last week during my conference and during my time with Annie & Burl - and also Kim. I think that I may expand on this a little more during the May Dr. A shows - we'll see. Following the BTR show this evening, I did a little post show on ustream. Those are always fun! But, now, it's time for bed. Have a great weekend everybody!